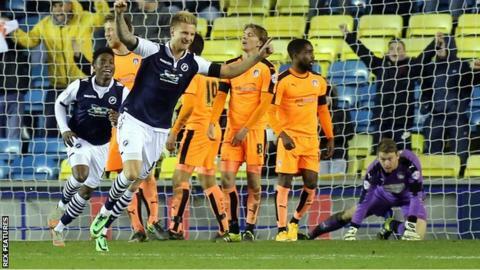 Colchester United manager Tony Humes was left frustrated by his side's "basic" defending in the 4-1 League One defeat by Millwall. The U's have conceded 41 goals this season, which is nine more than any other team in the Football League. "It was as poor a defensive display [as you can get] in terms of experienced players not taking responsibility," Humes told BBC Essex. "There's no kids out there who've not done what they should do. It cost us." He continued: "It's the story of our season. They've coped with it when they're playing against their mates in training, but when it comes to the opposition and a place like The Den, they didn't deal with it." Tom Eastman's mistake allowed Lee Gregory to open the scoring for the hosts and despite Chris Porter's effort, the U's were unable to deal with Millwall. Humes said he was now in the market for bringing "support in", but added he must share some of the burden. "It's my responsibility for the team out there, we had two late call-offs from defenders, we've got six defenders injured but that's the same as anyone so I'm not making excuses but it doesn't help," he said. "Of course I look at myself. It's mine and Richard Hall's team to coach. However, it seems they can perform in training in the week but can't do it on a Saturday. "I'm not passing the buck. First and foremost it's my responsibility." Meanwhile, Colchester have signed centre-forward Femi Akinwande on a development contract until the end of the season. The 19-year-old former Dartford striker has played two trial games for the U's after scoring 12 goals in 18 matches for Maldon and Tiptree.